After a slew of unoriginal reboots and remakes in recent years, my heart sinks when yet another is announced. Especially when it is a reboot of a much-loved fantasy starring the late great Robin Williams. I have to say I had rather low expectations for Jumanji – Welcome to the Jungle. However, much like the saying goes “expect nothing and you might be pleasantly surprised” I came away from this with a very different opinion than I had going into it. I’m going to assume anyone reading this has seen the original, so understands the premise that people get sucked into the Jumanji board-game, and can’t return to the real world until they complete it. Jumanji – Welcome to the Jungle takes that idea and updates it, so the board-game now becomes a computer game. When four kids in detention find it, and decide to kill some time playing it, they are stunned to find themselves not only sucked into the game, but inhabiting entirely new bodies, based on the character they selected. As you’ve probably gathered, these characters are played by the A-listers in the cast, so Johnson, Black, Gillen, and Hart all find themselves technically playing 16/17 year olds, stuck in adult bodies. That idea could have gone either way, but they really take it and run with it. Black in particular seems to love playing a spoilt prom-queen type, stuck in his short, stocky, and obviously male body! The story itself really exists to utilise some dramatic set-pieces, as the island within the game throws all sorts of surprises at them, from stampeding rhinos to gun-toting mercenaries, sent by the game’s resident baddie, Van Pelt (Cannavale). Other than Cannavale – who hams it up completely – the performances from the main cast are all solid and really good fun. You almost wish that they didn’t have to finish the game and go back to their teen alter-egos. All of the cast seem to be having a fantastic time, and it’s infectious. Jumanji – Welcome to the Jungle looks epic, with stunning special-effects and amazing scenery. Henry Jackman’s music is also en pointe, and helps draw you further into the world of the game. As you’d expect in a fantasy like this, at times the script is cheesy, but not in an off-putting way. And indeed it is far better than you usually get with this kind of fare. 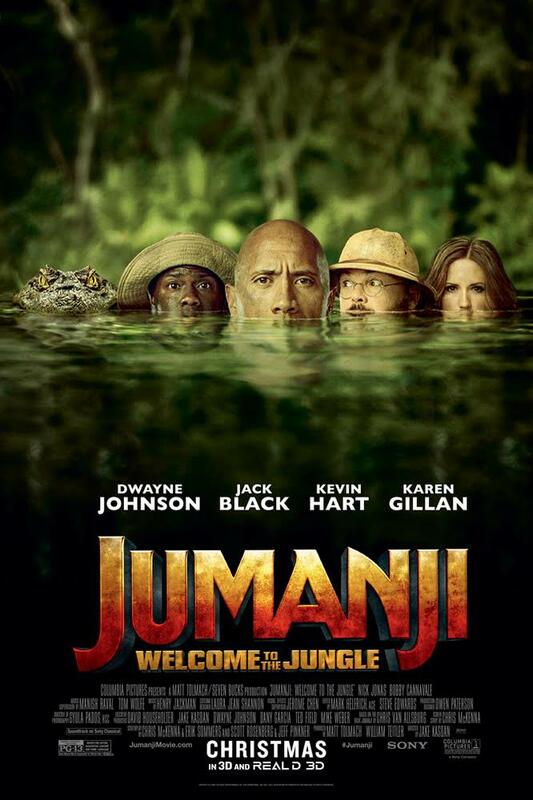 Jumanji – Welcome to the Jungle only has one purpose, and that’s to entertain, and it does indeed manage that. It won’t be winning any awards, and it is unlikely to be regarded with the reverence of the Robin William’s movie, but it is a fun frolic, and isn’t too taxing. It’s kind of like Freaky Friday meets The Breakfast Club, smattered with a touch of Romancing the Stone and Indiana Jones. The jokes mainly hit, and it is exceedingly likeable. Far better than it should be, Jumanji – Welcome to the Jungle surpasses expectations in a good way, and is a fun addition to the Christmas movie releases, even if a reboot is essentially a lazy idea.